We’re breaking down! Tempers are flaring, the crew is becoming ragged and moody, crying one moment and laughing the next. Fits of pique! Excessive displays of spleeniness! We’ve entered day four of our excursion. Tuesday afternoon we left the SS Ordinary in our rickety couch-shaped vessel, possessed only of a spiderman blanket, a pillow, a grey puppy, a stack of books, a set of colored pencils, snacks and drinks, medicaments, philtres and tinctures, and a vat of lego bricks with which to fashion a new vessel, if the puppy tears too many holes in our current conveyance. And now that the fever had broken, and the quarantine will surely be lifted, the crew is falling to pieces! Sigh. It’s not so bad, of course. It all started when I said Isaac should turn off the cartoons and do a little of the homework that was sent home. What? NO! He’s sick! His belly hurts, he HAS to watch cartoons, IT’S A BLATANT BREACH OF SICKDAY RIGHTS! ACTION WILL BE TAKEN! In the form of tears and foot stamping. Isaac tried to have a tantrum, I think probably in imitation of certain other members of the family. He can’t really maintain it, though. He can’t stop himself from giggling if you say anything remotely funny, and that spoils the whole effect. Everybody should have to spend a week with Isaac, cast adrift from real life on a messy couch, through drizzly rain and weak winter sunlight, through brief hopeful pools of afternoon warmth and quickening dusky winds. People come home from work and school, and leave again, and we sit on the couch, watching it all go by. It’s a rare pleasure. 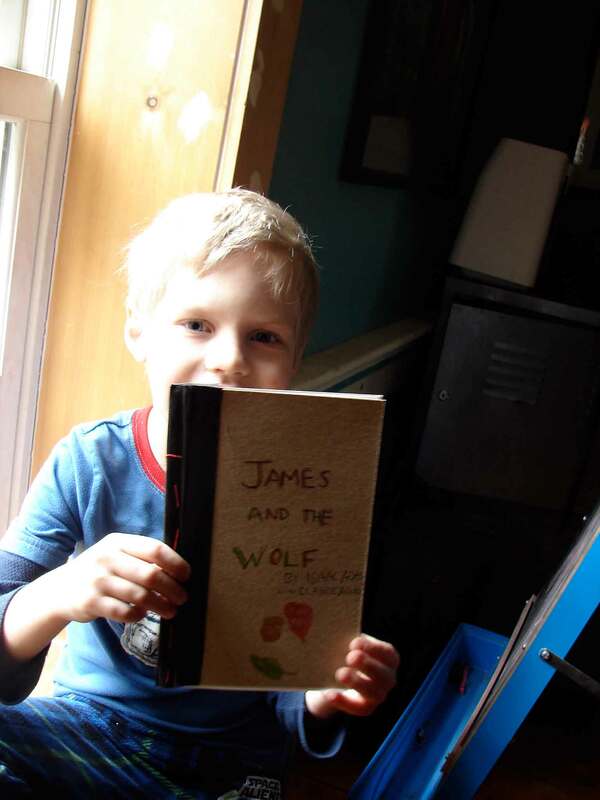 Isaac and I made a book. We gave it a cardboard and gaffer tape binding, and I broke a needle in two places trying to sew the pages through the tape. Isaac dictated, I wrote the words, and Isaac illustrated. It tells the story of a boy named James. He lives in the forest with a pack of vegetarian wolves who like to snuggle with him. (“Really?” David said, upon reading this part, “Isaac came up with that? Because it sounds suspiciously Claire-y to me.” It’s all Isaac, I swear! Of course, I made Isaac….) Let’s see, where were we? Ah yes, one day, Black Fur the wolf goes across the river to pick raspberries. A pack of non-vegetarian wolves surrounds him and tells him he should eat his friend James, because human boys are delicious. Suddenly, James and his wolves come up to the raspberry patch! (In a stunning twist nobody could have predicted, James is riding on a giant squirrel-dog named Scog.) James goes rushing at the leader of the other wolves, who is understandably afraid, but rather than hurt him, he feeds him a cake made of nuts, raspberries and leaves. Why, it’s delicious! All the wolves become vegetarian and they spend their days helping each other find food and making meals together. And that’s how it goes. The End. We also made ice cream. I always bake with the boys when they’re home sick (if they’re up to it). It’s so companionable and comforting, and they have such surprising and tasty inspirations. Isaac and I wanted to make ice cream. He wanted to make “crispy ice cream.” So we had to decide what that meant. Isaac wanted to add almonds, I wanted to add chocolate. I remembered that we’d made some delicious chocolate almond bark last month, so we made that and dropped large pieces into the ice cream as it froze. So good! I toasted the almonds to deepen their flavor, and we put a sprinkle of sea salt on top. And the other week, as you may recall, Malcolm and I were playing with a hand grater and some chocolate chips. 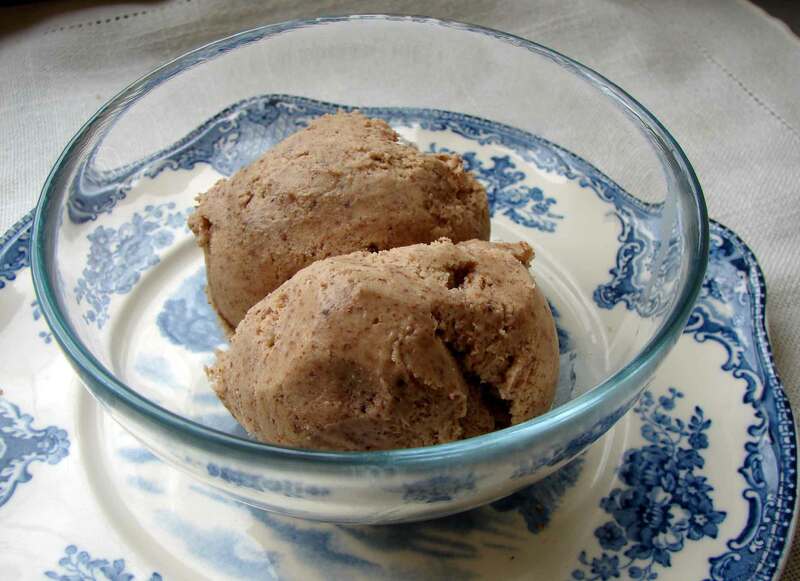 We wanted to see what the fine powdery slivers of chocolate would be like in ice cream instead of chocolate chips, so we made a simple maple spice ice cream to test it out in. Also so good!! In a medium saucepan over medium-low heat, warm the milk, spices and vanilla. In a medium-sized bowl whisk the eggs, maple syrup, brown sugar, cornstarch and salt until frothy. Stir in one cup of heavy cream, and freeze according to your ice cream maker’s instructions. As it’s freezing, drop in the grated chocolate in small batches. Melt the chocolate in a saucepan over a saucepan full of lightly boiling water. (Be careful not to get even a drop of water into the chocolate or it will seize up.) Meanwhile, toast the almonds in a dry pan over medium heat until they’re just starting to brown and smell a bit toasty. Crumple them in your fists and drop them into the chocolate. Line a large baking sheet with foil. Spread the chocolate mixture in an thin layer on the foil. Don’t worry about getting it neat or even, you’re just going to break it into pieces later. Sprinkle salt over the top. Chill in the fridge for about an hour, until it’s brittle. When it’s cool break it into pieces about an inch square. Eat them, or drop them into ice cream! 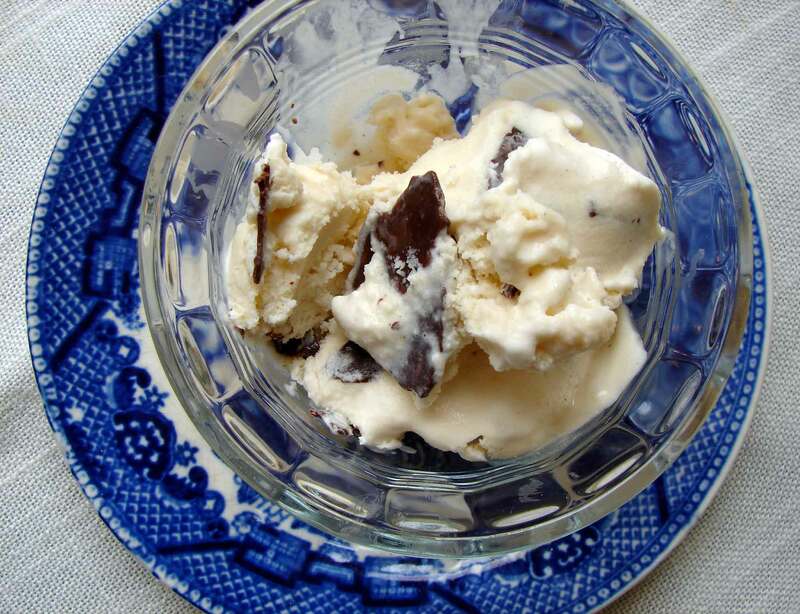 This entry was posted in chocolate, dessert, recipe and tagged chocolate almond bark in ice cream, grated chocolate in ice cream, maple ice cream, sea salt chocolate ice cream, spice ice cream, toasted almond chocolate ice cream by Claire. Bookmark the permalink.